Is that sweet, forlorn baby elephant with the big flappy ears really 70 years old? Three generations have cheered for Dumbo as he overcame the jeers of mockers and separation from his mother only to fly victoriously into the history books. 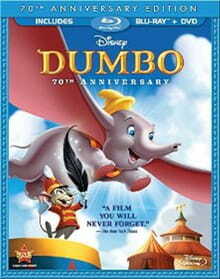 The Walt Disney Studios Restoration Team transformed Dumbo, rediscovering its original color settings and restoring it to its former glory in this high-definition (HD) 70th Anniversary Edition for DVD and Blu-ray. In doing so, they’ve ensured its life for a fourth generation and beyond. For those kids to whom “Dumbo” merely conjures images of a flying elephant, this restored edition provides a high-quality introduction to the movie that producers called “Disney’s most emotional film” at the time of its creation in 1941. The story opens in a circus and focuses on the animals—the humans are inconsequential. When the storks arrive with various babies (which may incite creative conversations between parents and children), Mama Jumbo waits anxiously for her little bundle of joy, but he does not come until days later when they are traveling to their next performance. The other elephants are aghast when little Dumbo’s ears pop out. Their immediate and inexplicable condemnation still evokes sympathy and sadness for Dumbo. What a great teachable moment for parents who view the show with their children. When Mama Jumbo is thrown into solitary (and locked away in chains) after defending her baby and causing a ruckus, Dumbo is relegated to the disdainful job of clown. He is truly a pitiful, sad little elephant surrounded by mean, self-absorbed people (and elephants). But then he gains an unlikely friend, Timothy Q. Mouse, who provides several entertaining and silly moments sure to evoke giggles. Timothy and Dumbo’s inadvertent drunken haze produces a dream sequence full of pink marching elephants and other such nonsense. This is the only part of the show that seems to drag on—modern viewers will grow impatient with the length of the nonsensical dream. But soon enough Dumbo discovers that his greatest so-called fault is truly his strongest, most empowering asset—those flappy ears can make him fly. Vindication comes not through a “nanny-nanny-boo-boo, look what I can do” attitude, but through his honest joy in finding his destiny. One friend believed in him and helped him discover what he was born to do. That’s enough for any of us. Kids and adults alike should be intrigued by the bonus feature titled “Sound Design Excerpt from The Reluctant Dragon,” which shows how the sound effects for these older Disney movies were created. In this clip, a movie executive wanders into a sound studio where workers are preparing to create the sound for a train sequence. Clanging cymbals, wobbly aluminum sheets, horns, electronic voice machines, and more seem like so much chaos in the studio. But on-screen, we watch and hear a cheerful little train wake up, gather steam, and zip down the tracks. Viewers accustomed to today’s computer-generated sound effects may be tempted to think of the pre-computer methods as quaint until they witness the complex and creative choreography that it entailed. Featuring extras on DVD and even more on Blu-ray, the 70th Anniversary Edition is also being released as a movie download on Amazon.com.